Oooh this looks like a bit of fun. 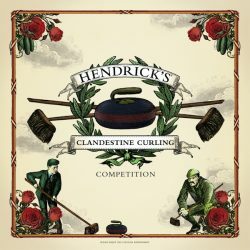 Hendrick’s Gin has joined forces with Happiness Forgets to launch the most unusual Clandestine Curling Competition for bartenders in celebration of Scottish poet, Robert Burns. Taking place at Happiness Forgets in Hoxton Square, London on Sunday 29th January, 24 bartenders will battle it out on the polished wooden bar top with an abnormally small curling set. The wonderfully peculiar take on the sport, typically played on ice, will run from 12pm until 4pm. The event, hosted by Hendrick’s Gin UK Ambassador, Ally Martin, will mark Burns Night with a more curious toast – a Hendrick’s and tonic, with three delicately sliced, wafer-thin rounds of cucumber – to celebrate its unknown affiliations with one of Scotland’s most famous poets. This most unusual gin, which is oddly infused with rose and cucumber, is distilled in the Scottish village of Girvan – a stone’s throw away from Burns’ birthplace, Alloway. Curling, traditionally played during Burns’ lifetime and well known to the poet, who referenced the game in his Tam Samson’s Elegy, was conceived on the frozen lochs of Scotland. Until very recently all the world’s curling stones were sourced from Ailsa Craig, the peculiar volcanic island located opposite the Hendrick’s Gin distillery.